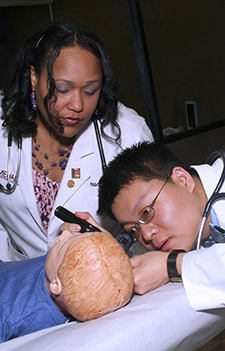 The Pamela C. Williams, M.D., Simulation and Clinical Skills Center is an 8,000-square-foot facility used for the simulation of medical procedures such as operations, medical examinations, and deliveries of babies. 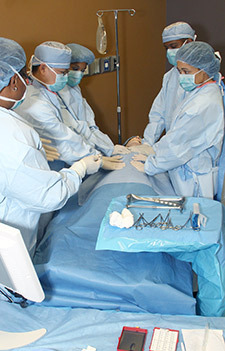 The state-of-the-art facility offers a new training experience for medical students to gain hands on experience as they replicate medical procedures in a controlled and stress-free environment. Simulators help students learn important skills such as team-building, critical-thinking, decision-making, and how to perform under pressure. 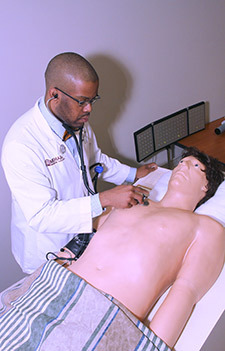 The Pamela C. Williams, M.D., Simulation and Clinical Skills Center allows medical students to simulate situations that range from routine medical check-ups to complicated surgeries, all performed on life-like manikins. 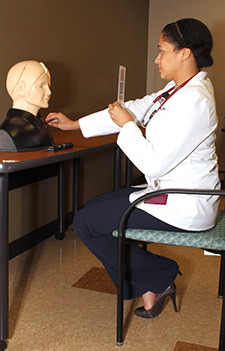 SimMan 3G is a wireless full-body manikin/simulator that serves as a simulated patient. He’s so lifelike that he can talk, breathe, shed tears, and even bleed. He can be programed to simulate countless medical conditions and even has the ability to go into cardiac arrest. When given a medication, SimMan provides the appropriate physiological response. Students can perform procedures on SimMan that range from a basic blood pressure check to a complicated surgery. Noelle is a full-body, female, advanced childbirth simulator that provides a complete birthing experience before, during, and after delivery. She is so realistic that student-doctors can actually listen to her baby’s heartbeat. She is able to dilate and she can even bleed from the cervix. Students can monitor her vitals on monitoring equipment in the simulation center. Pediatric Hal is a pediatric simulator that looks and acts like a five-year-old patient. His eyes move, he has a pulse, and a heartbeat. His breathing pattern can change and his lung sounds can range from normal, to wheezing, to a crackling sound that may indicate a respiratory disease. His skin allows students to attach real electrodes and defibrillator pads so they can track cardiac rhythms on their own equipment just as they would with a human patient. Newborn Hal is an advanced neonatal patient simulator that looks like a newborn baby. He comes to life with pre-recorded crying sounds. Hal’s chest rises and falls while breathing and he can even turn blue when deprived of air. Students can monitor his breathing and his heartbeat and he can be programed to more than 20 scenarios that help students prepare for the critical care of newborns. If you are interested in becoming a standardized patient, please fill out an application.